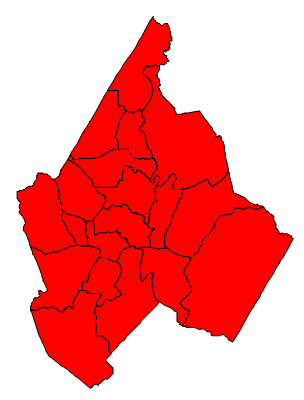 Avery County is located in the North Carolina mountains bordering Tennessee; the county seat is Newland. As of 2010, the population was 17,167. If Avery County votes a lot like its neighbor Mitchell, it’s because the two counties were once one and the same. Avery was split parts of Mitchell, Caldwell, and Watauga counties in 1911, the last North Carolina county to be created. Avery votes nearly identically to Mitchell County – solid Republican. And like its neighbor to the west, Avery has never supported a Democrat for President, or for any partisan office for that matter. It is known for being the location of Grandfather Mountain and for the production of many Christmas trees. Rural, isolated, and mountainous, Avery in recent years has become a retirement destination, though not to the same extent as other mountain counties. Mitt Romney won here with over 75% of the vote and carried every precinct; if a Republican sinks below 70% in Avery County then they are probably losing statewide. Forecast: The Republicanism of Avery and Mitchell counties stems from Civil War days, when the area was a Union stronghold. The people there had little in common with the slaveholding East and were staunchly opposed to secession. Their descendants continued to vote Republican because of heritage and not for any ideology on their part. The present GOP is a good fit for the social conservatism of Avery County’s residents, so the Republican winning streak has continued unabated. Avery County had a 3.67% growth rate in the 2000s, the population is expected to decline at the next census. Politically, little is expected to change. Indeed, the county may well continue to support the GOP for the next 150 years.